He was born on the 9-th of February, 1944, in the village Leontovka ( the Ukraine) in the family of peasants. After leaving secondary school in Dubossary he entered the faculty of physics and mathematics of the pedagogical institute named after Shevchenko in Tiraspol in 1961. In November, 1963, he was called up for military service. Sergey Leontiev served in Privolzhye military district. After leaving the army he continued his study at the institute in 1966. After graduation from the institute he taught physics and mathematics at secondary school in the village Karmanovo (Moldavia) from August, 1969, till April, 1971. Then from April, 1971, till July, 1977, he was the director of that school. In 1987 Sergey Leontiev left Higher Party School at Central Committee of the communist party of the Ukraine. He was one of few party officials who supported immediately the formation of a new state in Pridnestrovie. In March,1990, he was elected Deputy Chairman of District Soviet of People’s Deputies and its Executive Committee. In 1994 Sergey Leontiev was awarded Distinguished Work Medal for his personal contribution to the development of Grigoriopol district. The same year he was appointed the Head of the local authorities in Grigoriopol district and served till April, 1997. In April, 1997 Sergey Leontiev was appointed the Head of the president and government administration of the Pridnestrovian Moldavian Republic. In August,2000, he became the Head of the president administration. In December,2001, he was elected the Vice-President of the Pridnestrovian Moldavian Republic. Sergey Leontiev was the delegate at the second historic congress of peoples’ deputies of all levels where the formation of the Pridnestrovian Moldavian Republic was proclaimed. He became the member of the Provisional Supreme Soviet. 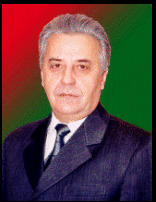 Sergey Leontiev was the deputy of the Supreme Soviet of the Pridnestrovian Moldavian Republic of the first and second convocations ( 1990-1995; 1995-2000 ). He took an active part in the resistance to aggression of the Republic of Moldova against pridnestrovian people. Sergey Leontiev was awarded the highest rewards: “The Order of the Republic”, “The Order of Personal Courage” and other medals of the Pridnestrovian Moldavian Republic. He is married, he has two sons.